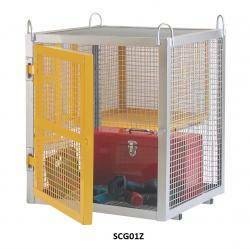 These galvanised gas bottle storage cages are a secure method of storage highly suited to gas cylinders and gas bottles. Models have either a single or double hinged door with hasp and staple compatiable with all standard padlocks giving tamper proof storage ( Padlock not supplied). 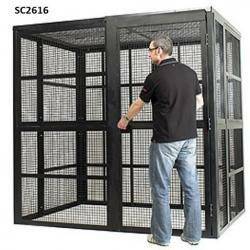 A sturdy fully welded steel contruction using steel box section and mesh gives a robust secure enclosure for your peace of mind when storing bottles , cylinders or other hazardous substances. The range is available powder coated or galvanised to suit your requirements . Powder Coated units are not rated for external usage. Most units are delivered assembled and ready for use to site. See optional extras for internal shelf and safety signs.